“A classic peep toe, eye-catching asymmetry, sturdy 4-cm heel, and fitted ankle strap. With padding softer at the heel than the toe, this shoe allows the balls of your feet impeccable control of the floor while firmly supporting your ankles and heels . A comparison between the heels of the RIVIERA and the EDEN will show the difference in cut. The sole is softer and the toe box wider than the RIVIERAs. Best possible additional news? Saint Savoy will be at Lindy Focus! – Massage with Danielle Knight! – Mary Kay Williams is returning again this year to draw $5-5 minute black and white caricatures of everyone, and is also taking commissions for some fabulous vintage pin-up style color caricatures! For any event, this is a formidable lineup. It is particularly noteworthy because Chloe Hong will be coming from South Korea and Saint Savoy from Austria, making this a strong international presence in our vendor lineup, which is truly a rarity, a treat, and not something to be taken lightly – you can now try on all those wonderful skirts and shoes that you see online, talk to the vendors in person, and perhaps save on international shipping. Saint Savoy has already been posting information about new shoe colors that will be available in the Facebook group and, based on the comments, the people are READY FOR YOUR WARES. I encourage you to become active in the Facebook group discussions if you have any questions. With Saint Savoy, specifically, as they are bringing try-ons only, unless you place your order by the end of November (see linked FB thread for information). The Jack n’ Jill Salon should start taking appointments soon and those appointments go fast. If you want something special/specific for your hair for NYE, reach out to Chatterblossom in advance for a custom piece, as she’ll only be able to bring limited stock of her seemingly endless inventory. Start compiling your best castoffs to consign at the Savoy Shop – I’ve already got a bag of goodies ready to go from my last closet purge. Are you ready for Lindy Focus? SOON. Get your LF merch on day 1 or they will sell out on day 2! In many ways I am still recovering from Lindy Focus 2015, the swing village that camps out at the Crowne Plaza in Asheville, with all manner of dancing and services that pop up to cater to a population that would prefer not to leave the hotel, lest they miss too much dancing, live music, performances, and classes. To help with our self-containment of joy, 2015 saw service providers such as massage therapists, shoe repair, tailors, the Jack and Jill Salon for hair cuts and styles, a caricature artist in the lobby, and two hotel room pop-up restaurants (Midnight Di-Noshery and Taco Focus) to serve food after the main dance that were, after two nights, axed by the hotel administration and replaced with food trucks, arranged by Lindy Focus to fill the void and the empty bellies of the masses. I love the smell of retail in the morning….errr, afternoon. There were retail vendors, as well! Let’s start with the Savoy Shop, a mix of consigned clothing from campers, vintage and thrifted duds with dancers in mind, and the home of the shoe repair service at Lindy Focus. Michelle Morrison has run the shop for the past several years and has this down to a science. I love seeing things in the Savoy Shop one day, then seeing them on the dance floor the next! I even spotted one of my own consigned dresses in the crowd one night and it made my heart soar to know it had found a wonderful new home. Of particular note this year, the Savoy Shop offered the largest selection of tie clips I have ever seen in one place – surely something for everyone! Artist in residence Ryan Calloway. 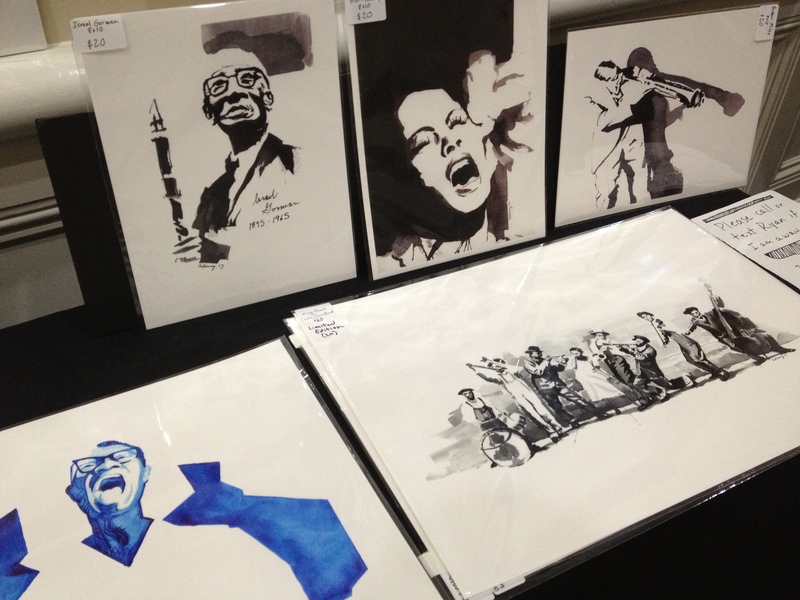 Dance instructor and artist Ryan Calloway was on hand this year, not only throwing down in the Superheroes of Swing finals, but also selling his wonderful jazz dance and music prints, offering giant, colorful books of his prints to flip through while you chat with the artist himself. Rather than having to worry about crushing your brand new artwork on the flight home, Ryan offered to ship the prints you purchase for free to your home starting on December 28 and ran the special through January 4 in case you decided you wanted a print after all. If you missed out on decorating your walls with his signature style, you can order his glorious prints online from his Etsy page. 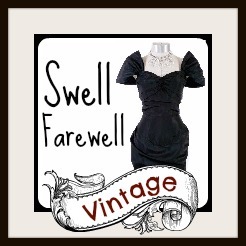 I’m going to give a shoutout to Forties Forward, making another appearance on this blog as my most prolific vendor – perhaps it’s because we are both from the Southeast and travel to the same events, or perhaps it’s because they have a great product and the get-up-and-go to make it to some of the best events in the USA. I imagine they do a great business at Lindy Focus, particularly around New Year’s Eve, for the perfect fishing touch to an ensemble. This year feathers were a trend at Lindy Focus and they offered some great feather options with sparkly jewels as the attachment piece, in addition to their signature blooms. Revive Fashions made, I believe, its debut this year at Lindy Focus, with the crafty Zoe Lechucita creating “custom made hair pieces, feather corsages, and tie pins” on site, while you wait or while you dance and come back to check on it later. 🙂 It was so great to see Zoe picking up the custom torch from Sharon Crawford, ensuring that you can have something custom made to match your ensemble for New Year’s Eve. This is the cutest, right? Another newcomer to the vendor program this year was Juniper Jewelry Designs, the work of Maddie FitzGerald, who was interviewed this year for the Lindy Focus blog about her jewelry designs, so I’ll direct you to the blog post for everything you’ve ever wanted to know about Maddie and her jewelry. Maddie’s sense of humor is evident in her notes left on the vendor table (see photo at left) and her collection is serious, with an extensive line of bracelets, necklaces, earrings, small and large, simple and intricate, a little something for everyone (as I like it!). You can check out her work on her Etsy page, which is really only a small sampling of the large display she had at Lindy Focus. Mary Jane wingtip in a new color combo! Last, but certainly not least, I was so happy to see Dancestore.com return to Lindy Focus, thanks to the efforts of Laurie Gilkenson (aka Nina’s mom). At any event there are shoe casualties, and Lindy Focus is, perhaps, well-equipped to deal with some repairs, but sometimes there are catastrophic shoe failures that only a new pair will fix and you only have so much room in your suitcase. At an event with 1,000+ dancers, it is critical to have a vendor like Dancestore.com present and on site, not just to fulfill wishlists and fill out shoe basics, but to turn a tragedy into a happy ending! I’m also going to insert a shameless plug for Beastly Beauties, who was not a vendor this year at Lindy Focus, but who made my feathered headdress that I wore on Ellington night – I am in awe of and eternally grateful for the efforts of this wonderful Raleigh-based designer. And there you have it! I hope I have not missed anyone, as I didn’t have as much time this year to shop and hobnob with all the sellers. If I have missed anything, please let me know and I will amend this post. Happy hopping and shopping, everyone! The mannequin display never held anything for long before it was snatched up from the Savoy Shop! A tailcoat and trousers ready for New Year’s Eve, at the Savoy Shop. 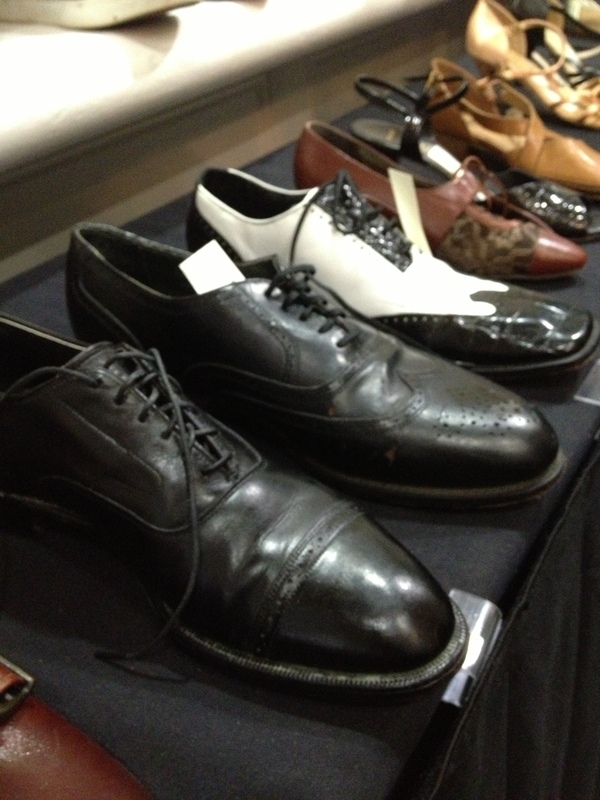 Vintage and gently used shoes as the Savoy Shop. A color print for the burgeoning clarinetist in your life? Artwork by Ryan Calloway. Who can resist a good Billie Holiday print? Artwork by Ryan Calloway. A luscious bloom from Forties Forward. Ties, hats, and blooms at Forties Forward. Feathers, fans, lights, and a screen at Revive Fashions. Ready-made blooms with sparkle at Revive Fashions. A necklace fit for a New Year’s Eve ensemble, at Juniper Jewelry Designs. Tree of Life pendants and clusters of beads and pearls, at Juniper Jewelry Designs. I’ve waited long enough to post, but I have largely been in denial about Lindy Focus ending – watching the myriad videos posted daily and attending in my local dances with the tidal wave of positive energy remaining and commiserating about the days that we don’t get to dance now that Lindy Focus is over. I’m still on LF sleep schedule, which means I have started this blog post at 2:15 a.m., as if in anticipation of a 3:00 a.m. DJ shift. But I must move on, and I’ve got to get these vendors posted if I’m going to remember anything about them – on with the post! I’ll start off with this year’s Lindy Focus feature artist, Ryan Calloway, who not only had fabulous jazz dance and jazz music prints available for purchase, but whose artwork was also featured in a limited edition Lindy Focus tee shirt. I particularly love his style and the way in which he depicts the movement in his prints – a feast for the eyes on the walls of any Lindy Hopper home. Next, we have what I believe to be my most frequent topic on Lindy Shopper, which would be Miss Sharon Crawford and her Creations by Crawford – her prolific event attendance as a vendor is unparalleled in the Southeast and her custom creations a work of art inspired by each wearer who contracts for her creative services. 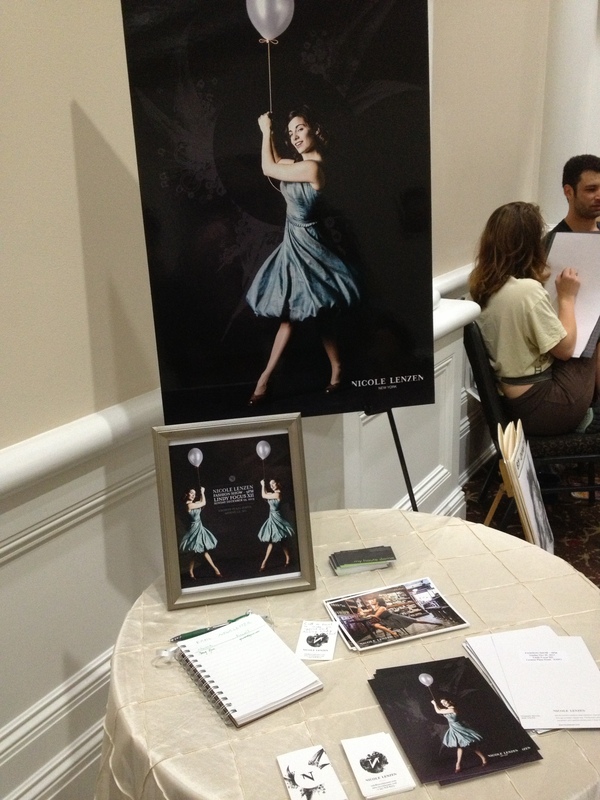 She works during the entire event, often so that a purchaser can wear their custom pieces to the dance THAT NIGHT. Her women’s pieces are stellar, but I think she really shines with menswear and her use of feathers to create custom lapel pieces. Sharon also vended jewelry pieces from Plain Jane, a local to Asheville designer, and shared a table with Zoe Lechucita, who was also making custom hair pieces during the event, with accents of sequins and jewels. The Lindy Focus consignment shop was in full swing, with everything from madras plaid pants to beaded gowns to glitter tap shoes. I was dying for a pair of the glitter tap shoes, but the sizes were just out of reach. I made a little money consigning a few things, which is great, and I overheard several people on New Year’s Eve saying that they had purchased their dress at the consignment shop. What a great idea to recycle dancer clothing and, as far as I know, this is unique to Lindy Focus. Forties Forward, another consistent southeast swing event vendor, was set up with their glorious blooms and has also added some feathered pieces to the lineup. Bejeweled centers decked the blossoms, as well as the feathers – the overall feeling from the booth was opulence. Right on, ladies! Nestled in the consignment shop I saw a small display for JitterButtons, featuring a selection of 8 buttons with clever, swing dance-related designs and slogans, such as “Friends Don’t Let Friends Clap on One” and an anti-pretzel sign. You can purchase one of their stock buttons from their website and you can also order custom buttons for your own event, as well! 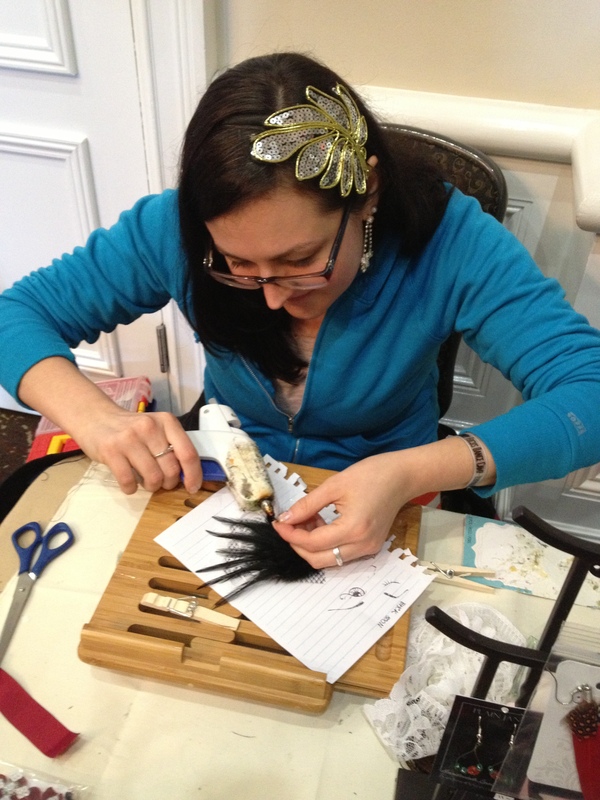 Zoe hard at work on a feathered piece. 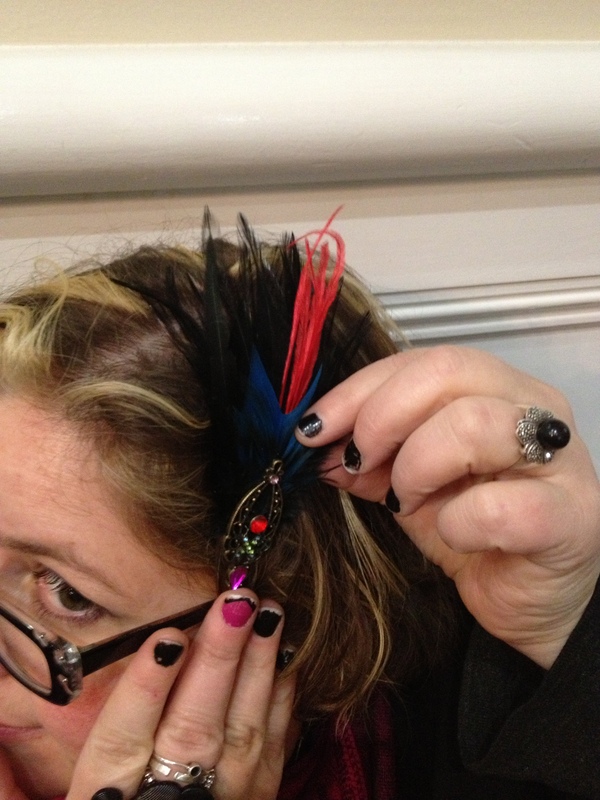 Sharon shows off a custom hair piece. An array of men’s footwear at the Lindy Focus consignment shop. 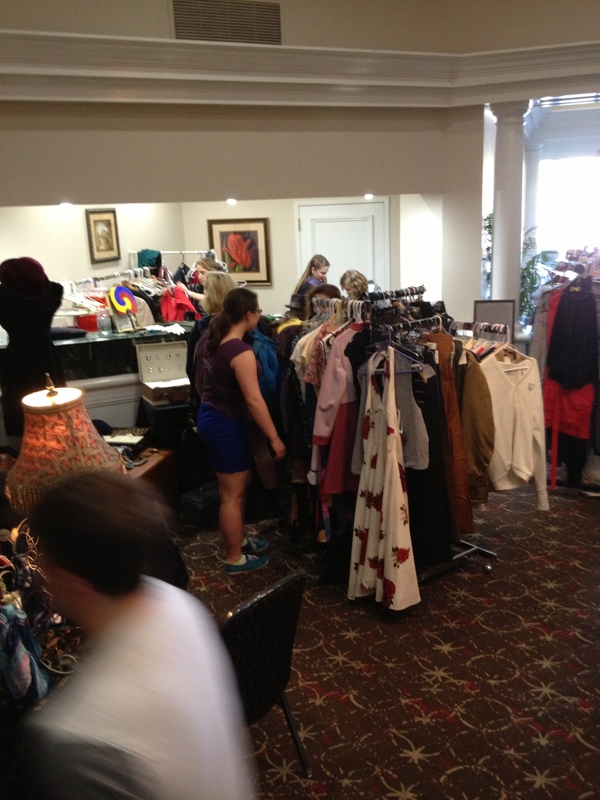 The consignment shop comprised most of the vendor area square footage. All the feathers! This lovely piece is by Forties Forward. Nicole Lenzen’s display served as a teaser for the fashion show earlier in the week. Just a quick note amidst the amazing chaos to tell you that exciting things are going on at Lindy Focus – there’s going to be another wonderful Nicole Lenzen fashion show, the LF tee shirts are selling out as of the first official day of camp, the consignment shop goes up today for dancers to consign their dance duds (plus glitter tap shoes! ), and the myriad vendors that round out our little micro-economy here at the happiest place on earth. Reports soon! As the trombone player stared into the distance, waiting for the next set to begin on New Year’s Eve at Lindy Focus XI, the trumpet player next to him prodded “Are you looking at what I’m looking at?” The trombone player followed the trumpet player’s gaze to the row of dancers lining the front of the stage and saw a girl who had come out of her dress on the top, exposing most or all of a breast. While some guys would be delighted at this sight, and agree that this is awesome, in actuality it becomes an issue because something very private has become very public. And when something very private has a very public reaction that could be detected, that brings out even more issues. Yes, guys, I know you want to see attractive women at dances; however, the consensus has generally been that most guys don’t want to be a horn dog at dances, distracted by so much cleavage or full boobage that it becomes ogling and/or pushes them into creepy territory. Generally, guys who want to respect boundaries are going to be uncomfortable being pulled between instinct and decorum and are probably just less likely to dance with a potential wardrobe malfunction. When the girls are in full display, or perhaps spilling out of one’s top or dress, the movement of Lindy Hop could turn pulse into a full trampoline bounce. I have seen this and been intimidated by watching someone dance like this. It is at that point that the dance becomes something else entirely for those within view – bystanders find themselves watching a car falling off the precipice of a cliff rather than watching an enjoyable aesthetic. It’s the apprehension that makes it so distracting for me – consider that the scope of the apprehension can go further than your dance partner. For Lindy Focus, this was probably more of an issue on New Year’s Eve (as retailers notoriously only offer sparkle in cleavage-friendly shapes), but I did notice other things throughout the event, like sheer shirts over darkly contrasting bras (camisole, anyone?) and ill-fitting strapless dresses that looked as though the top were Hoover Dam about to burst from a flood of chest. Much of this goes back to buying clothes that fit you well (but not tightly – there is a distinction), but also shapes and necklines that are complimentary to your shape. If you have a smaller chest, you can get away with showing more skin – this is an inversely proportional relationship. 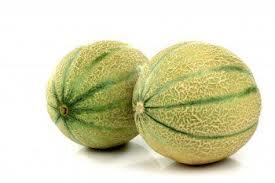 Likewise, the larger your chest is, the less skin you can get away with showing, because there is more of it. I am all for cleavage, but proportion, fit, and security are certainly factors to consider. Another consideration, for the burgeoning nudists among us, were the children present at Lindy Focus. I almost tripped over sleeping children near the stage on a couple of nights, but there were also children running around at the main dances. Let’s try not to scar these kids for life. The trombone player in the story is my husband and I really don’t want to come home and hear stories like this. Thus, when you are dressing yourself for an event, consider the fit of your clothing, the risk of certain necklines, the athleticism of swing dancing in general, and the proportionate amount of cleavage that will be attractive without becoming a nuisance to you or to others. EDITED: To add that this post has sparked an extensive discussion in our online Lindy Hop community – Dogpossum sets forth a timeline of the discussion (relevant blog responses and social media) mid-way through her blog post, if you’d like to follow and/or join the ensuing discussion as of February 8, 2013. Noticeably absent was Dancestore and their signature Aris Allen shoes, a serious business faux pas, in my opinion – 900+ attendees, many of which (including me) were looking to buy or replace dance shoes. To make up for the lack of being able to replace dancers’ worn out shoes, Lindy Focus offered a shoe sueding and repair service. Marathon dance event vendor Sharon Crawford of Creations by Crawford was on hand creating custom hair pieces, boutonnieres, and other elegant accoutrement for ladies and gents at her table, positioned next to the ballroom off the registration lobby. Sharon’s table was always open and always had a bevy of guests – from hairdressers to nappers to chatters, all were welcome to hang out. I don’t know how she got any work done, but I’d wager to say she’s the longest working vendor at Lindy Focus (as evidenced by the sunrise/survivors photo on the last day, she was probably working the whole time). Forties Forward – love these gals! Forties Forward, one of my favorite hair flower vendors, was right across the hallway from Sharon, making sure that the ladies of Lindy Focus had all the hair flowers they needed. With the customary gussying up for New Year’s Eve, I’m sure they did well. Added inventory this year: false eyelashes. Va-va-voom! Also a regular, Mike Thibault’s jazz and lindy hop prints are always a welcome sight. I love his selection, especially the new-ish one of the interior of the Savoy ballroom packed to the gills with dancers. If you haven’t seen what he has, definitely check out his website – Vintage Jazz Art – and pick up something inspiring to put on your wall. Finally, New York designer Nicole Lenzen not only had a lovely rack of dresses at her vendor table, she debuted her first collection of dresses and rompers for dancers at Lindy Focus in a glorious fashion show during one of the camp meetings, featuring some of your favorite female instructors as models for her designs. The collection was movement-conscious, high in twirl factor, and rich in textiles. The designer loves to work with fine fabrics, produced ethically and created into garments in New York’s garment district. Nicole hopes to have her website ready to take orders soon – she does custom garments as well as those featured in her collection. Nicole is a delight and I look forward to seeing her business grow and flourish. Check out the fashion show in the video below for a full view of the collection and also Jessica Keener’s lovely photographs. I think a fashion show and debut collection must be a swing dance event first, if not a Lindy Focus first, no? Clearly we are heading in the right direction. I couldn’t resist posting the beading detail from one of Nicole’s dresses. You should go look at the fashion show, but you won’t be able to see all the wonderful details in her dresses! I am eagerly anticipating my departure to Lindy Focus XI, not only for the shopping opportunities this year, but also for my appearance as a panelist in one of the Lindy Focus Field Day discussions! Come to the Overlook ballroom at 1:00 p.m. on December 30 for a discussion on “Scene Building in the Age of New Media” with me, Rebecca Brightly of Dance World Takeover, Jerry Almonte of Wandering and Pondering, and others! 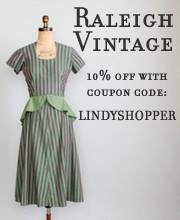 In addition to vendors and merch, Lindy Focus boasts a consignment shop where you can bring your gently used clothing and shoes (up to 10 items) to sell in their shop to make a little extra cash for yourself (to do more shopping with, of course!). There’s also a shoe shop where they are offering a sole sueding service – $15 per pair for high quality suede and professional strength cobblers adhesive. 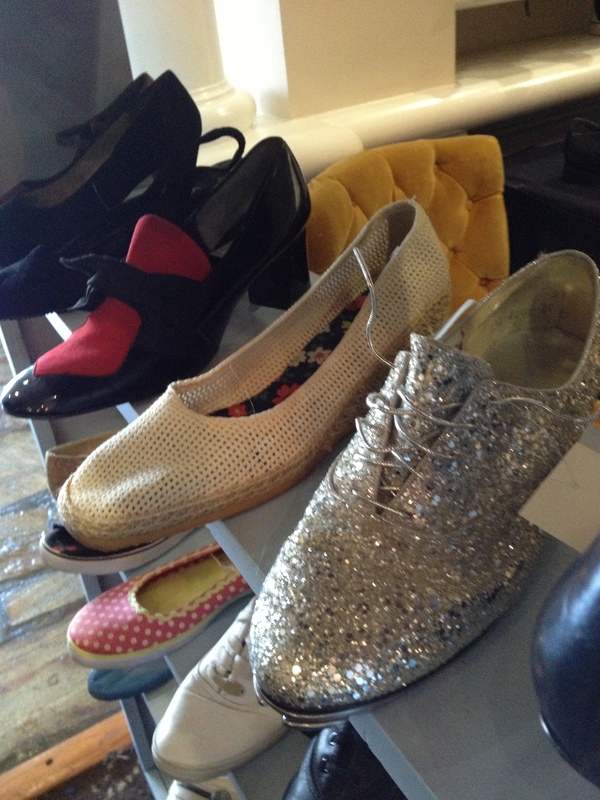 They will also have many pairs of vintage and dance shoes for sale at the shoe shop. So many things! Finally, Lindy Focus has a room with some emergency supplies, if you find yourself ailing outside of drugstore business hours. From Eva Millwood: “In room 128, there will be available band-aids/neosporin, Tylenol, Advil, Aleve, Tums, and Benadryl for $.25, and emergen-c and off-brand 5-hour energy shots for $.50. Someone will almost always be here!” They may add to this list of available items, so come to this room if you find yourself in a bit of a medical bind, but don’t need urgent care. Lindy Focus continues to exceed expectations – I can’t wait to be there! My outlet tux! Photo courtesy of Bonnie Stanley Photography. I had heard rumors about the Hillsborough Formalwear Outlet in Hillsborough, NC long before I actually went there – mostly people who had purchased a hat from their collection, but they spoke of a giant warehouse full of tuxedos, for rent or for purchase, at very reasonable prices. 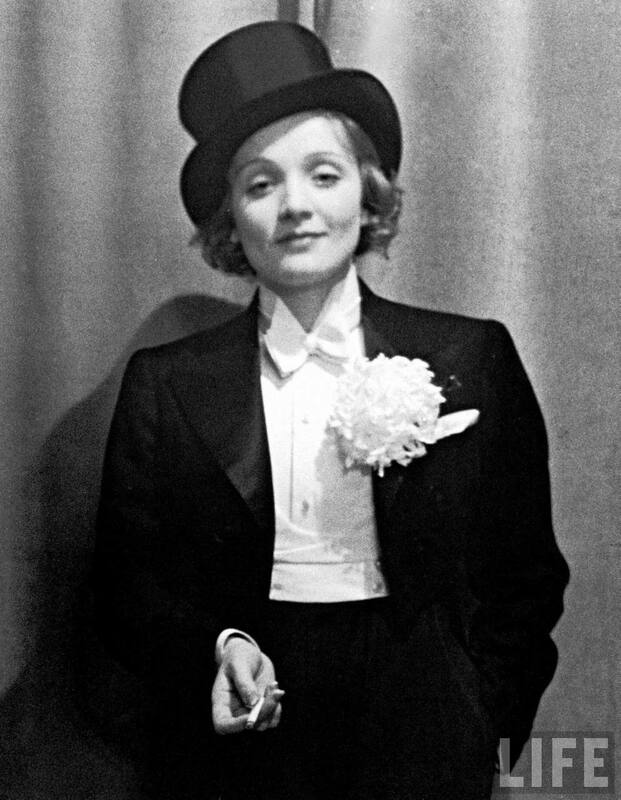 When Raleigh’s Vaudevillain Revue decided to go 20’s/30’s for a show, I decided it was time for me to pull a Dietrich for my performance and get a tux of my own. The Deal: jacket, pants, shirt, vest or cummerbund, bow tie, studs, and cufflinks for just over $100 (including tax). You take it home, it’s all yours, everything you need but the socks and shoes. How do they do it? When formalwear retailers and renters liquidate their stock, this place buys the goods. You are purchasing sometimes new, sometimes previously rented, goods. They have a wide selection of tuxedo styles – from tailcoats to modern jackets, every imaginable color of vest. If they don’t have it in the main warehouse/shop, they have a few other warehouses to draw from, including one that is almost entirely full of polyester 70’s tuxes with ruffled shirts – imagine the color combinations (*laugh*cry*shudder*)! All this to say that they probably have a tux that will work for you and your needs. The customer service was fantastic – someone was essentially assigned to me and helped me painstakingly put together a men’s tux for my not-a-man’s body. I was elated with the result and the price – I’ve put together Halloween costumes with fewer pieces that cost more than this. The question at the forefront of my mind today (after a trip to the mall where there is an overabundance of sequins and glitter) is what will I wear on New Year’s Eve at Lindy Focus? Something that twirls, something that sparkles, something like…this Striking Gold dress from ModCloth! But…it’s not available in my size. Still, it’s a good dress, someone should sparkle in it (in red or gold), no? 😉 For me – the search continues! I love the micro-economies that pop up at swing dance events. I hope that vendor areas continue to develop at events and bring dancers closer to the goods and products they need and want. The post was from Bill Speidel, collector of sartorial antiquities, who acquired several top hats from an estate sale and decided to sell one of them at Lindy Focus through Sharon Crawford’s vending table at Lindy Focus. This top hat is spiffy – a Herbert Johnson of London beaver top hat, size 7, sold by Fifield and Stevenson of Chicaco, IL. Bill is asking $125.00 for the hat, which, given the condition and wearable size, is a good price for this topper. 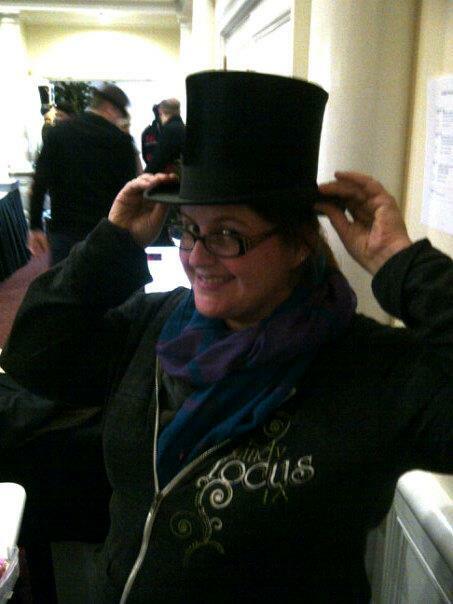 If you are interested in the top hat, there are two ways to go about acquiring the hat: 1) if you are at Lindy Focus, find Bill Speidel or find Sharon Crawford’s table in the vending area – she’ll be the one sewing custom boutonnieres and fascinators; or 2) if you are not at Lindy Focus, email Bill at wspeid@cox.net to arrange for payment and shipping. Buyer pays shipping costs.